After a meeting that went on for a gruelling 3+ hours, we didn't seem to get very far! About 75 people were present and the meeting was fraught with political maneuverings and lack of resolve by many of the Commission members. The issues that had been discussed in depth previously at sub-committee meetings were glossed over and misrepresented - and the real issues of the Proposal made at the Trails Committee on April 2001 were not even dissected. During open time at this meeting everybody was given a chance to speak for a maximum of 3 minutes per person, with no opportunity to respond to comments made by others. There were a total of 34 people who took this opportunity to voice their opinions, of which 18 were in favor of off-leash dog walking on Open Space, 11 against, plus 5 speakers from the Marin Humane Society. 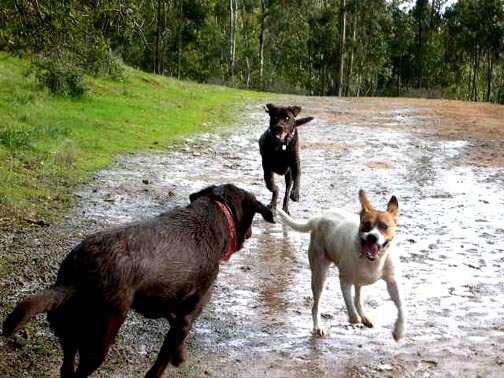 It was proposed that individual dog walkers be limited to 2 dogs at a time on Open Space fire roads, both of which can be off-leash (the original proposal was for up to 3 dogs, but only one off-leash). Professional dog walkers would be limited to walking 6 dogs at a time, all of which may be off-leash and under voice control (the original proposal was for 3 dogs on-leash and 3 off-leash). A VICTORY!! A unanimous (but reluctant) vote to allow individual dog walkers to walk up to 3 dogs off-leash on Open Space fire roads!! ... the Committee's reasoning being that county law allows an individual household to own up to 3 dogs. Today's meeting was mainly focused on the policy for the general public, and commercial use of Open Space by professional walkers will be addressed down the line. Reform to trail head signs and addressing the problem of dog excrement was discussed. Open Space will be providing effort/volunteers/brochures to educate dog owners and will be citing people who do not obey the rules, which they will be strictly enforcing. It is extremely important that we all educate ourselves do not abuse the privilege of walking dogs off-leash on Open Space fire roads. Irresponsible ones can ruin it for the rest of us. Committee discussed the language for the new rule regarding "3 dogs off-leash on Fire Roads" for individual walkers who bring their dogs on Open Space. This revised language later went before the Commission later in the day, who voted for the new rule. 2) 3 dogs on-leash trying to keep up with 3 off-leash is DANGEROUS, especially on steep downhill terrain. Dangers of less control (hands full), tripping, tangling of leashes, potential injury to handler (back/neck trauma). 3) The dogs on-leash would be too restricted to be able to go at their own natural pace. 7) Lack of studies conducted in this field. Fran Brigmann agreed to meet with some DWOM representatives on 4/18 to discuss this. We need to be able to walk a minimum of 6 dogs off-leash on Open Space in order to be able to continue to provide this much needed service to our community and their furry companions. "A righteous man has regard for the life of his beast."